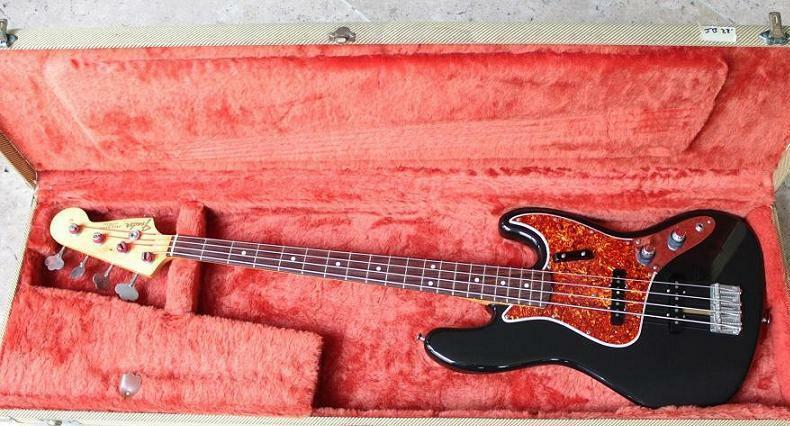 U.S. Vintage Reissue '62 Jazz Bass [1982-1998], 4-string bass guitar from Fender in the Jazz Bass series. This is my main instrument, a 1996 '62 Jazz reissue, made in USA. I play it since 2004 and it is a monster. Wherever I plug in - in a studio or at a gig, soundmen get eargasms. I've bought this thing used from my friend, who bought it from some other guy in the early 00's. The condition of the instrument was nearly mint which was surprising - the bass was my friend's main instrument for a couple of years. The bass dates back to 1996 (serial number V077741), and there's a little golden "Fender 40 anniversary" sticker on the back of the neck. All the rest is usual '62 specifications: two-piece sunburst alder body, one-piece maple neck with a very thin yellow nitro finish, red tortoise shell 4-ply pickguard (black-white-black-red), two vintage single coils, two concentric knobs (volume and tone for each pickup), top loading bridge, reverse open Kluson tuners and so on - you can always find it at Fender site. The package also included tweed case, thumbrest and "ashtrays". Thumbrest was installed once, but the previous owner uninstalled it, and there were two holes in the pickguard. Ashtrays were not installed, and there were no holes in the body, only two small holes in the pickguard for the neck pickup's ashtray. There were also two small paper bags in the case intended to absorb moisture. Pretty nice! Previous owners were smart guys and did no modifications to the whole thing, keeping its' "vintage" value. So let's get straight to the details. This is why you should buy this thing. It sounds pretty amazing for a passive bass. Far better than standard and deluxe Fenders. The sound is very full, rich and bright. It sounds more a modern instrument than a vintage bass - compared to real vintage Fenders I had a chance to play. Maybe someday it's sound will change to be "more vintage", but I like it the way it is now. It has a sort of "clicky" attack, followed by fat j-growl. The "click" is probably a string touching the last fret on the neck, just like with slap, but on this instrument it happens regardless of the technique - even with fingerstyle. To avoid it you must touch strings very gently and very close to the bridge - Jaco style - but, IMHO, this click is a very pleasing sound giving every note better definition. It also means fast runs sound better on this bass, and you have that "pick" sound even if you don't use a pick. Each string sustains very nice and the sound is more balanced and compressed than on many other jazz basses, which means you will have to use less compression in the chain. It's harder to play piano piano since the notes ring even when you touch strings very gently. You also get tons of highs with all controls wide opened, so it's good to roll off the tone controls for about 30%. By the way, the whole story with two tone control knobs - you really don't need two of them. It's okay to be true to the original specifications, but it's not useful and it takes more time to adjust the tone. I've heard that slap on early Fenders was not that good due to the small frets. I had no chance to play original '62, but this one slaps very nice. The frets are small, but not that small. The sound is not as bright as on ash-bodied '75, but it's very fat. I've played jazz bass with ash body before this jazz, and now I think I prefer the "alder sound". Overall, the sound has a sort of "heard it before" vibe, it cuts through the mix and it does not conflicts with other instruments. Construction of this bass is one big weak point. The truss rod is hidden inside the neck and you can see its' tail at the point where the neck joins the body, but you can't access it - the neck pocket overlaps half of the hole. You have to remove the neck for that. You don't have to miss with the truss rod a lot, maybe once in a couple of years, so I guess that's not a big problem. 2. Two tone knobs - you don't need them. Volume pots are that shiny telecaster/precision style that I hate - you can't see in which position exactly the pots are. I think regular Jazz bass controls are much better. Usually Fenders feature string through body bridges, and this is a top loader. I don't have problem with that, but there are people who certainly dislike it. Okay, I know, all Fenders singles hum, but since there's a Vintage Noiseless option, I'd go for it if I had a chance to order a custom-shop instrument. You do meet this annoying BZZZZZZZZZZZ problem at certain clubs with poor grounding or nasty stage lights. Nobody could explain me this thing. I mean, it's located on the treble side, not where your hand is. Probably, in the early days there was some sort of technique when this thing was useable, but now it's very painful when slapping. I guess it's good if you play the bass upside down. 6. There's a peg on the back of the neck - right under the tuners. There were times when bass players were using a long rope going from the end of the neck to the end of the body. Funny. 7. Ashtrays. They look so cool - I could not resist putting them on. I didn't want to drill the instrument so I used a double-sided scotch tape. It does make it look a killer bass. No question. The problem is - there are only two small areas left where you can touch strings with your right hand. You either pluck or slap strings near the neck (say, early Geezer Butler style) which is the most comfortable position, or you use the neck ashtray as a thumbrest and pick the strings between the pickups. This area is relatively small and you can even hurt your hand. You can not palm-mute strings near the bridge, you can not play that Jaco-style near the bridge, and playing with a pick is extremely difficult. Several times I found myself automatically trying to mute the ringing opened string near the bridge (to shorten the sustain) - and hitting my hand on this shiny thing. Enough! You can use the neck ashtray as a thumbrest, but the bridge cover is a real pain (that's what Marcus Miller did on his '75). I feel comfortable with the glossy neck and body, and it still looks new with no cracks at all. It's heavier than a regular black case, it's bigger and it can be damaged easily. The yellow tweed can get very dirty. There are no metal corners, and if you need a road case, don't use this one. A man who assembled this bass was a rough and brutal person. Today even Squiers are cut out with CNC machinery, so they are clean and you don't find bugs and gaps. However, my bass was made by hand. There are countless flaws in the construction, which become noticeable after a close inspection. There is an ugly chunk of glue at the nut, frets do not look perfect, there are gaps between the tuners and the neck, and all the parts of the bass assembled in a manner which tells you it was very fast. The neckplate screwed in so violently that the finish cracked around it. All the screws holding a pickguard are seated under different angles. If I compare Fender's craftsmanship to Gibson's - there's a large gap. I've got a '99 Les Paul Special, which is really not the top-end model in the Gibson line, but it's very clean and tight - every single piece of hardware sits on its place without gaps, flaws or whatever. I can't say the same about Fender. The neck on '62 Jazz is narrow and comfortable. Although you can't "fly" as on several "modern" instruments, such as Warwicks, ESP's and others, it's still very fast. The bass invites higher action, just like Precision. It's not that vintage when you start playing it, and that's a good point to my taste. No questions here: due to the simplicity of the construction, it's very sturdy. The finish wears out and it has dings all over, but that's how Fenders look. -It was probably assembled by some local drunk. +It looks a killer (just don't get too close). -the construction features many useless and stupid things. -If you need just a good working instrument; you might be considering another model. As I figured out from the price list, vintage reissues are among the most expensive models - they cost more than standard and deluxe. 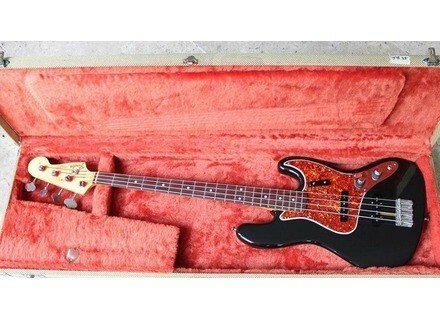 Although there are very expensive FMT's, but they are hotrods, and here we're talking about plain jazz bass. So, regarding the value, this bass should cost about $1000 - considering the worst craftsmanship possible (street price is about $1300). But, since Leo Fender was a real genius, this simple instrument remains one of the best instruments ever designed - even all the low-tech detailing cannot kill the true spirit of this bass. It worth buying it if you find one for a reasonable price and you had a chance to try it. Don't even think about purchasing any of Fender products without trying it - they are very different. You can find two new bases from the same year and the same model, one with the neck curved like a bow and falling off, and another just perfect. 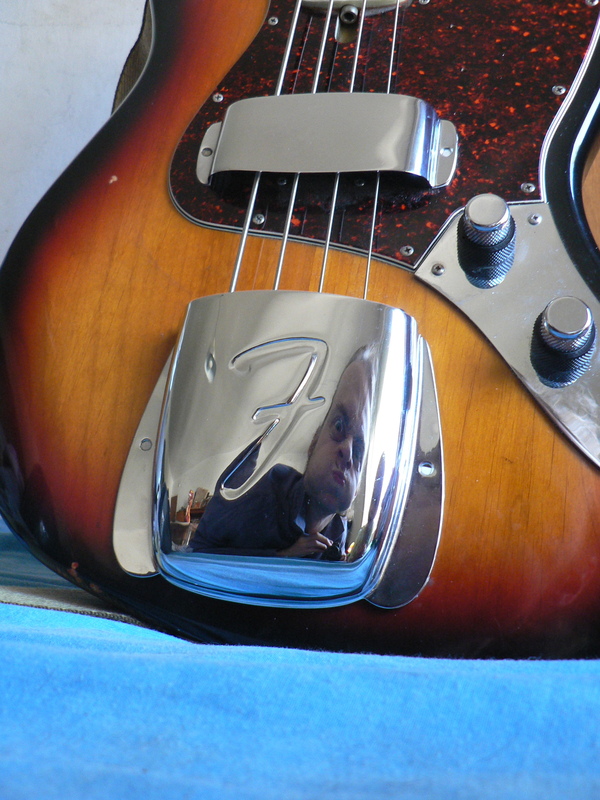 And it's very sad that the instrument produced to celebrate the 40 anniversary of the company clearly shows the gap between the original '62 pre-CBS jazz bass and it's handicapped copy. It's a good bass, but I'm afraid it won't be as good in another 40 years as original '62 today. Now here's something you won't see on Fender website. I've got this bass strung with 40's and at some point I wanted to switch to 45's which I prefer. So I've got a nice set of Fender nickelplated 45's and put them on. I've made a couple of bridge adjustments and expected to adjust the neck as well. And yes, the neck started bending, bending, bending... whoa! I disassembled the bass and wanted to rotate the truss rod - the experienced guys told me to make about 1/2 turn a day. Surprise! The truss rod didn't want to rotate at all. I could unscrew it but the opposite direction was blocked. I think the previous owner screwed it completely. What to do? I've put the neck back, tuned the bass... the neck told me goodbye and took a shape of a nice arc. The end of the story: I had to repair the neck. The repairsman told me this is the most common bug with old Fenders. The truss rod ends with a nut which must be fixed inside the neck. My bass had a not-that-hard maple neck and the nut was simply rotating inside, destroying the neck. Gibsons, for example have a BIG nut on the truss rod's end and it never does such things. He installed a new (not fender'ish) trussrod, made a new fingerboard, frets and binding. That was one piece of work and I've paid about $280 for the repair. Now my Fender is not stock but the neck is stable, I can adjust it without disassembling the instrument (he made me a small cavity in the pickguard to access it) and he even kept the logo - although the neck was refinished and completely re-worked. While guitars might survive with old-fashion neck construction, basses put a lot of tension on the neck and many old Fenders suffer from this disease. It's probably a big secret of Fender corporation, but I've already heard a couple of similar stories. There's no cure from this, and if you have vintage or vintage reissue Fender - keep in mind that one day it might surprise you. If you want to hear how it sounds - check out the last release from my band, SHOOM. I played my '62 on all the songs, with Genz Benz Shuttle 600 head and it was recorded line out from the amplifier's preamp (no microphone).